Garmin has emerged as a dominant force in golf GPS watches over the last few years, producing them in all shapes and sizes and with a mind-boggling array of features. But until the launch of the Garmin Approach S10, they’ve all been pretty expensive. Historically, golfers have had no problem paying in the region of $200-$400 for a single-feature sports watch they may only use a couple of times per month. 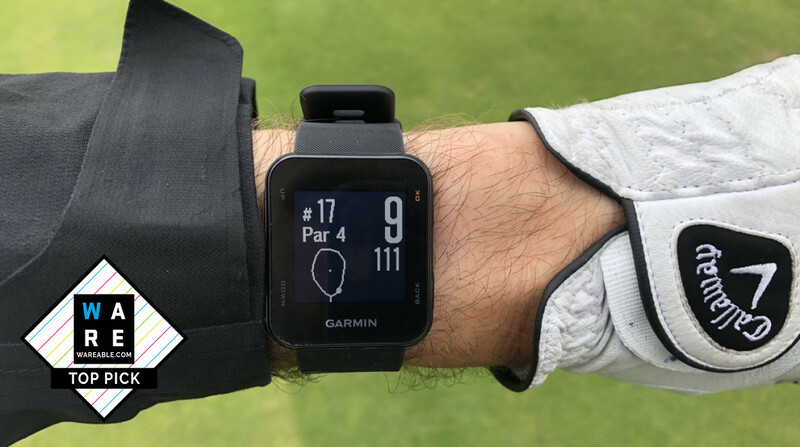 But with the rise of smartwatches with GPS built-in, golf watches have come under threat from great free golf apps for Apple Watch/Android Wear such as Hole 19. Enter the Garmin Approach S10 (and its sister band, the X10). These represent Garmin’s cheapest ever golf-specific watches, keeping features basic. But has Garmin cut too much? Let’s explore and find out. The Garmin Approach S10 follows the S20 with a classic watch form that the majority of golfers will gravitate to. It’s pretty basic looking and hardly going to be part of your everyday wear, with its black plastic case and a low-res MIP monochrome screen. The resolution there is only 128 x 128, so this isn’t winning any smartwatch awards. There are four buttons on the sides, to help with navigation while you play and setting up your round. The strap is a simple buckle-fastened silicon number, which is fairly comfortable, and stays put while you’re playing. It’s also non-replaceable. As with all Garmin watches now, it’s 5ATM water-resistant, so it will survive a dip up to 50m, and time in the shower after your round. However, given there’s no sports tracking, that’s not hugely significant. When it comes to features, things are pretty basic. The main feature is distance to the pin on any of the 41,000 built-in golf courses worldwide. You also have information on hazards (bunkers, water, dog-legs) and lay-ups as well. In addition, you can score your round if you turn the feature on within the settings (it’s off by default) and that data will show up in the Garmin Golf app afterwards. Intriguingly, this is where the biggest sacrifice has been made on the Garmin Approach S10. There’s no Bluetooth built-in, so this has to be done by manually connecting your device to your PC/Mac. That feels really outdated, and actually makes us wonder whether the low price is really worth it. So how does it perform on a round? We took it for a spin. In terms of usability and accuracy we certainly had no reservations. The buttons on the side are logical and clearly labelled, so it’s easy to start a round and enter scores. Distances were accurate not only against our Garmin and Bushnell watches, but also on-course markers, which is always reassuring. When you’re on a hole you can cycle from hazard to hazard, with all information clearly labelled. What’s more, we didn’t even miss any of the more advanced features from more expensive Garmins. We’ve always had pretty minimal tastes in golf devices, and actually criticised features likes the Garmin Approach X40’s club logging, or the TomTom Golfer 2’s auto-shot detection. We like how the Approach S10 keeps things simple. A minor gripe was that the Approach S10 seemed to get confused between holes more than other watches, and often we had to re-select the current hole. As we mentioned there’s no Bluetooth, so you’ll need to plug your watch into a Mac/PC to see your post-round data. You’ll need Garmin Express installed, and then the data will be fired into the Garmin Golf app (not Garmin Connect). So what’s that experience like? Well, due to the basic nature of scoring on the Garmin Approach S10, it’s kind of limited. The scoring itself was fine, stroke score for each hole input, but the resulting table and feedback isn’t exactly visually engaging or in any way insightful, and there's no provision for Stableford scoring. It’s nice to have a record of every round you play and your score, but we won’t be giving up using the Hole 19 smartphone app for detailed hole maps and data any time soon. While features have been stripped back to a bare minimum, battery life excelled – and is one huge tick in the Approach S10 box. You should be able to get three rounds from the watch before recharging, and even a week sat in a drawer didn’t seem to diminish the battery at all. The quoted battery life of 12 hours of GPS and 14 weeks on standby certainly seemed on point to us. That’s actually really important, as we find that remembering to charge golf watches before a round is the biggest headache, and it means the Approach S10 is more likely to be good-to-go when you need it. I really have doubts with Garmin's quality. I had recently purchased a Vivofit 2 and it presented me with lots of issues! (1) unable to sync occassionaly, (2) unable to update firmware, (3) time goes slower by 1 minute per day if there's no syncing done!! To top that up, Garmin customer service was helpless and unable to resolve it for me! In contrast, I have no major issues with Fitbit Versa and Ionic while customer service response was great! Accurate review. This sums up my experience with the watch. It can lose track of the hole several times a round which is highly irritating. Doesn't seem to happen with my Garmin S3. For this reason alone I would rate it as crap. THE FIRST TEE IS ADJACENT TO 18TH GREEN. WHEN I START S10 TELLS ME I AM ON 18TH. HOW CAN I CHANGE TO FIRST?